Our son Nikhil in his Grade 3 found division a bit difficult. Along with the division difficulty came the prime numbers and factors. We decided to solve the problem by making arithmetic interesting by me giving out various tips that I had learned while at school, especially from Mr Venkitesha Murthy, our Grade 7 mathematics teacher. Mr Murthy taught us mathematics through various stories, anecdotes and riddles. He also inspired us with the achievements of great Indian Mathematicians like Ramanujam, Bhaskara and Aryabhatta. It took me some time and effort to grasp the concept of factors and prime numbers even while in Grade 7 and hence Nikhil’s difficulty with the same was not at all surprising to me. Everyday Nikhil and I spend almost half an hour in the car – dropping him off at school, picking up after school, commute to the swimming pool or tennis court or for music class in the evening. Nikhil called it a ‘father-son’ time and used it to discuss all those which he thought would attract a comment or a spoof from his mother or sister. This practice continues to date and the subject kept changing as Nikhil grew up to his current Grade 12. To solve the riddle of division and factors, I came up with a game. In our province, Ontario, most licence plates on vehicles has four alphabets followed by three digits. Three digit numbers can be easily handled by a Grade 3 student. Any vehicle we came across on our drive, we used to analyse the number. To begin with was to see whether the number was even or odd and hence conclude its divisiblity by ‘2’. Then it was to add all the digits and if the resultant sum was either ‘3’ or ‘6’ or ‘9’, it was to be concluded that the number is divisible by three. In case the number was an even one and the last two digits (ten and unit place) was divisible by ‘4’, then ‘4’ is a factor. If the unit place is either ‘5’ or ‘0’, the number is divisible by ‘5’. In case ‘2’ and ‘3’ are factors, then ‘6’ will also be a factor. If the sum of the digits resulted in ‘9’, the number is divisible by ‘9’. If the unit place has ‘0’, then ’10’ is a factor. With this game on, every day we would analyse about 10 licence plates and with that the problem of division, factors and prime numbers were resolved to a great extent. The first car my wife bought for me on arrival in Canada was a new Honda Accord and when I went to take the delivery, the agency had already procured the licence plate for me. The number was ‘BBZW 139’. In North America, licence plates move with the owner, not with the vehicle. If you sell or change vehicles, you keep the licence plates and put them on your new vehicle. Hence this number plate remained with even though I changed three cars. The number also reflects a bit on my personality as 139 is an odd number and also a prime number. It has only 1 and itself as a factor and is not fully divisible by any other number. I believe that I cannot be affected by any factors or divided by any other than 1 – the God Almighty – and myself. The digits ‘139’ fascinated me as it added to 13, my day of birth – 13 March. My school Roll Number was ‘931’, which again added up to 13 and my Defence Account Number was 161005, which again added up to 13 and the list goes on. This is mere coincidence and has nothing to do with the ‘unlucky’ 13 and it has never bought the lady luck to my side and I cannot claim to be unlucky also. I do not believe in numerology or astrology and hence this trail of 13 never ever cast its bad luck on me. ’13’ is also known as ‘Baker’s Dozen’ – instead of ’12’, bakers always packed 13 for a dozen in Britain. In the mid-thirteenth century, Britain enacted the statute of Assize of Bread and Ale, which set the relationship between the price of wheat and what the subsequent price of a loaf of bread from a certain quantity of wheat should be. If the baker accidentally cheated a customer by giving them less, they were subject to extremely severe fines and punishment. In order to avoid such accidents, bakers started to count 13 for a dozen. Children turn teenagers when they turn 13 and we are all aware of what it means. Apollo 13 is the only unsuccessful moon mission. An oxygen tank exploded and the survival of the astronauts on board was hanging in balance for several days, but they all came home safely. Many Christians believe that 13 is unlucky as there were 13 people in the ‘Last Supper’. ‘Paraskevidekatriaphobia’ is the term used to describe the fear of ‘Friday the thirteenth’ and ‘Triskaidekaphobia’ the fear of number 13 . Researchers estimate that at least 10 percent of the US population has a fear of the number 13, especially for Friday the thirteenth. Mathematicians point out that 13 is not so unlucky, but it earned all its bad name as it is an odd number and a prime number. It is 13’s bad luck that it follows the ‘perfect number’ 12. Many believe that 12 is ‘perfect’ as it counts to a dozen, there are 12 months in an year, a day consists of two 12-hour cycles etc. The extend of ‘Triskaidekaphobia’ in the US is so high that more than 80 percent of high-rise buildings do not have a thirteenth floor, and the vast majority of hotels, hospitals and airports avoid using the number for rooms and gates as well. The number 13 may be lucky or unlucky, but one cannot blame the number for it and will always follow number 12 and precede number 14. PS. Now I do not have the above licence plate. 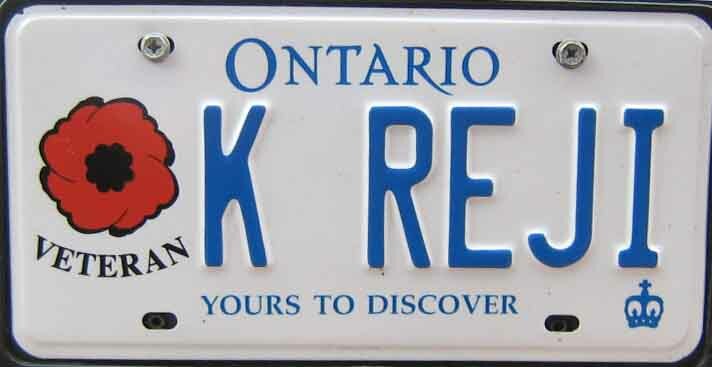 The Government of Ontario, in recognition of my service with the Indian Army has given me a new plate. My gratitude to them for honouring a Veteran from another county, where even the soldiers are least cared for. Never thought one can do so much research on numerology. I heard a lot about 13 as a number most of the people fear, a room or floor number to stay, a car number for registration, a date to travel, a jersey number for players etc. The detailed imput by Col Reji is an interesting read. കൊള്ളാം റെജിച്ചായാ…. വെള്ളിയാഴ്ച്ചയും പതിമൂന്നാം തിയതിയും ഒന്നിച്ച് വന്നാല്‍ ഒറ്റ ഒരാളും പരീക്ഷയെഴുതാന്‍ സെന്ററില്‍ ഉണ്ടാവില്ല… ആദ്യം എനിക്ക് മനസ്സിലായിരുന്നില്ല, പിന്നെ മാനേജര്‍ ആണ് പറഞ്ഞ് തന്നത്.. രണ്ടും ശരിയല്ല എന്ന്. പല ഹൈ റൈസ് ബില്‍ഡിംഗുകളിലും ലിഫ്റ്റില്‍ “13” ഉണ്ടാകാറില്ല… നിക്കിയെ കണക്ക് പഠിപ്പിച്ച രീതി ഇഷ്ടായി… ലേഖനവും 🙂 (Reji = It is a good article. On any Friday the thirteenth, there would hardly be any candidates at our examination centre and I never realised it until our manager explained it to me. The lifts of many high rise buildings here do not have ‘thirteen’. I really liked your methodology of teaching Nikhil and also the article). Well written sir. Got the essence of number 13.enjoyed reading.Thanks and regards to madam. Fun with numbers , interesting . Nicely researched as always. Well done, Reji.